What good is a sound app on a phone or iPod, really? Just ask a Filtatron user. As with plug-ins and desktop software doodads, I find out of the sea of apps on iOS, a tiny handful are genuinely useful. But those select few can prove indispensable. I would count the Moog Filtatron in that category. Sure, in case there was any doubt, the app contains a subtle link to the Moog hardware catalog, an effort to upsell you to the company’s sound gear. And sure, owners of said gear might turn up their nose at the idea of something with the Moog logo on an iPhone. But make no mistake: this is a darned useful tool, and a must-download if you have an iPod touch or iPhone. The surprise is, it may appeal most to lovers of other gear. 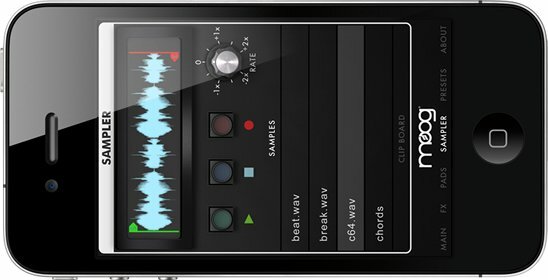 Connect a mobile synth or noisemaker to your handheld, and you have a pocket-ready effects and recording unit. 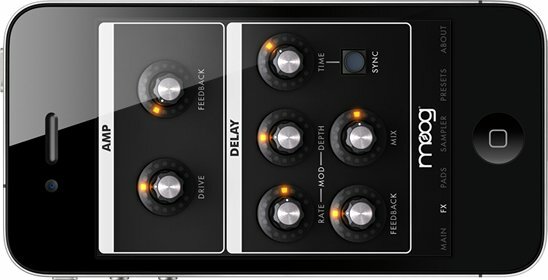 You can add simulated amp overdrive warmth, pop a handy delay on any audio out, and make quick samples on the go. You can plug into a mixer and have sound in a live performance set ready to go should other gear fail or crash. Any notion that mobile software will replace hardware dissolves in an instant. With the Filtatron app in your pocket, every audio jack and strange noise source begins to look like a chance for creative music making. It makes you seek out more gear, not less. I can say this with more confidence now, as well, having been using the Filtatron for the past weeks. Something about its simplicity, its warm sound, the attention to finger-sized design, and its combination of features makes it ideal. I’ve used it to sample and transform various gear around the house and on the road, and played once with it live as external effect. You can import sounds to the Sampler, and record and play back samples of any length. The VCO pad now allows chromatic scales. You can choose to route audio to a speaker, earpiece, or even wireless audio via Bluetooth. A settings panel lets you tweak sample rate, audio latency, and control response. I had no problem making the Filtatron work on my second-generation iPod touch – no minor feat, as that generation of device has a slower processor and often performs poorly with this sort of app. One thing I haven’t been able to test in 1.1 yet (aside from the Bluetooth stuff): I did have issues with the previous version making FTP sync work with longer recordings. I’ll let you know if that appears to be fixed. I was unable to entirely verify the issue even in the previous version. But I think the Filtatron really is an ideal example of what a mobile music app can be. I’d love it even if it said Brogue on it.